The other day I was in the grocery store and happened to look at the price of croûtons. At my store, a 5 oz bag of croûtons is $2.99. That is $.60/oz. To put that in perspective, that’s the same price per oz as filet mignon. While I’m sure other stores charge less for their croûtons, any price is too much when you consider that they cost almost nothing to make, use up stale bread, and taste just as good when you make them yourself. In fact, I made a big batch yesterday and won’t have to bother with croûtons again for at least 6-8 months. Here’s how I did it. 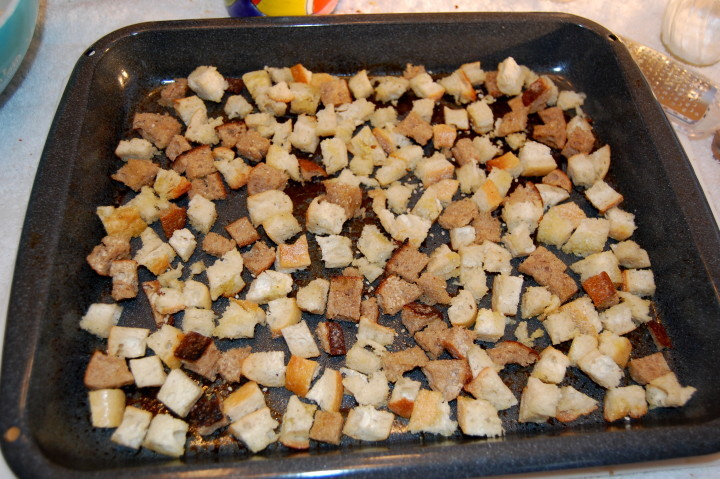 First, I gathered up some stale bread from the freezer. 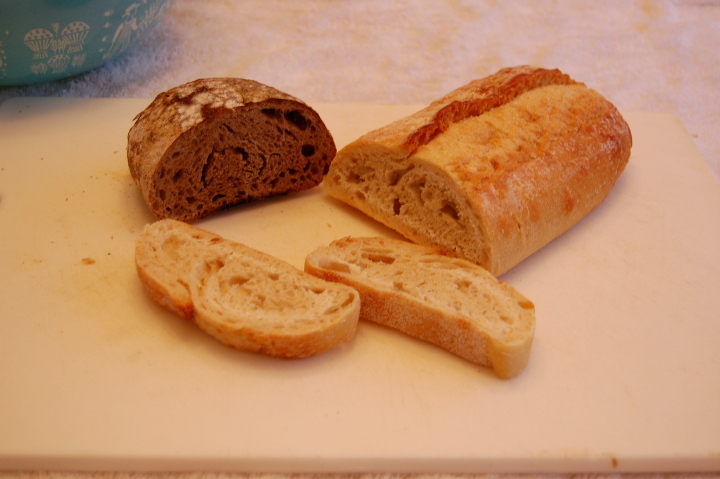 I had a half a loaf of sour dough and a quarter loaf of a wheat/white mix. Together, it made up about a pound of bread. I microwaved the bread for about a minute to soften it enough to cut. 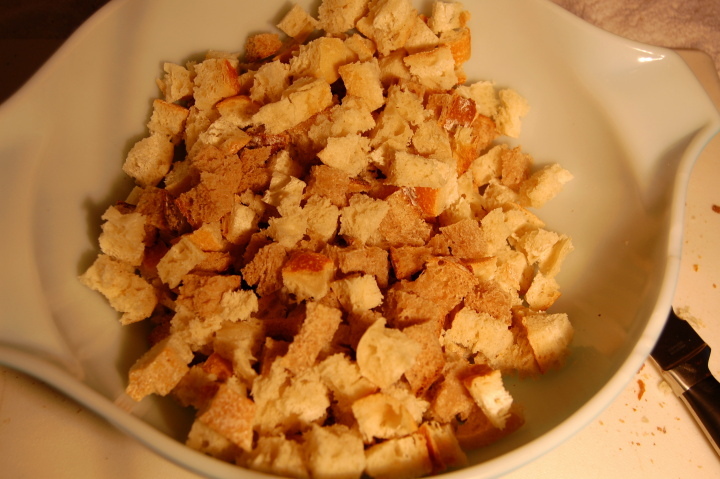 Then I diced the bread and put it in a bowl. I didn’t worry about the cubes being perfectly square, but I did try to keep them bite sized. Next, I seasoned the bread. Most croûtons have salt, pepper, garlic, and olive oil. I also included onion powder and sesame seeds. I added the seasoning and oil a little bit at a time and then tossed the bread with my hands until they were evenly coated. You don’t want the bread to be saturated with the oil. I also tasted as I went until the bread tasted good to me. After that, I laid the croûtons out in single layer in a pan. I read that you should cook the croûtons in the oven for 20 minutes at 275 degrees. I have found that it works just as well to broil them. Simply stick the croûtons under the broiler until they start to turn golden (2-5 minutes). Then take them out and toss. Put them back in the broiler, and let the other side get golden (30 seconds-1 minutes). The second side will brown much faster, so watch that they don’t burn. 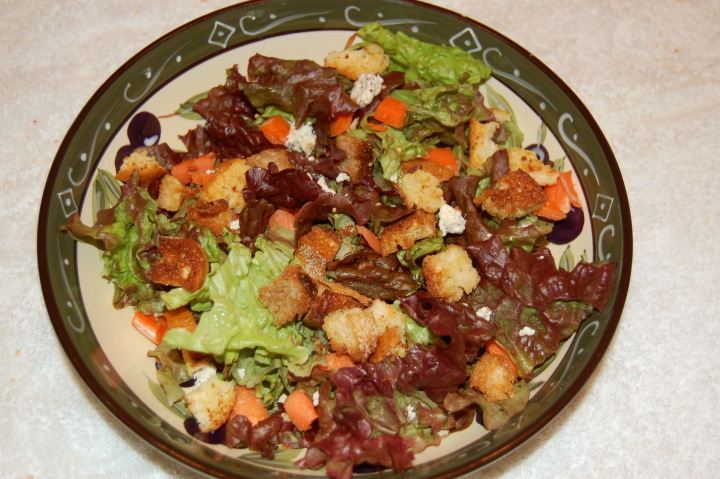 Cool and enjoy on top of your favorite salad. Cost of Dish: Bread: free because it was stale and would have been thrown out; olive oil: $.25; other seasoning: $.25. Total Cost of Dish: $.50 for 1 lb of croûtons, or $.03/oz. In the Store: $2.99 for 5 oz of croûtons, or $.60/oz. It would cost $9.60 to purchase 1 lb of croûtons.